For the last few years, whenever President Obama addresses the nation, it is with a sincere attempt to plead with the American public to hold politicians accountable for their inaction in order to avert the latest GOP created crisis. He explained to Americans what is happening in Congress and on Capitol Hill and to let it be known that as their elected president, he is doing all he can to fix this problem before it becomes a catastrophe. Good on him. Someone in Washington is taking their job seriously. But then the craziest thing happens every time President Obama gives a speech, the speaker of the House, John Boehner, the man responsible for the stale mate occurring in Congress that has the ability to not only knee-cap America, but cripple the entire world’s economy, stands in front of the press and lies. What is going on? Did I miss something? What the hell is happening in Washington? Is Obama president or isn’t he? Do we really have a system set up where the speaker of the house deserves the same treatment as the president? When President Obama addresses the nation it is to inform and convey a message of assurances and hope to the American people. Whereas, when Boehner addresses the media, it is to send out a message of disdain for the president with talk filled with rhetoric, finger-pointing, and vitriol. And in an ironic, done-in-conservative-fashion, he finishes all of his speeches with a, ”…but this isn’t about Obama and Congress” conjecture even though he spent the first 10 minutes of his 12-minute press release slamming and blaming Obama and taking ZERO blame for his part in the US coming precariously close to financial devastation. Wow, I can’t believe how dumb he must think we are as Americans. Or maybe I can. He is so brazen as to blatantly lie to America because he knows we will do nothing to him when he does. So many Americans were ready to believe that the president wasn’t an American citizen, or how he isn’t a Christian, or that he knowingly had IRS audit certain political groups, or whatever the newest lie is that the Right has fabricated in order to undermine his presidency. So I guess I can see why it is so easy for them to believe this? These right-wing, self- proclaimed “champions of the people” have created a fictional stalemate in Congress preventing the raising of the debt ceiling claiming that it is a “financially irresponsible act” for them to make. This is coming from a Congress that has raised the debt ceiling 33 times in the last 31 years. THIRTY THREE TIMES. And 29 of those occasions it was done under the reign of a Republican president. But now, for some reason, when Obama is in office Congress has decided that they can no longer do this. Even though the man has handled every one of the tumultuous quagmires that Bush left for America as admirably and without complaint as one could do, Congress has decided that they can no longer do this. Really? Obama’s plans have been met with blatant bipartisan gridlock and out right lies by the Right in an attempt to blackmail the president by holding the country hostage, or do their bidding. Under the incorruptible watchful eye of a Republican led Executive, the very wealthiest people in this country have enjoyed tax breaks and have been allowed to exploit loopholes in the tax code making them even wealthier for the last decade. Now that times are tough, they are trying to use their vast political clout to influence the Republican Party to do their bidding to ensure that they can continue to prosper while the rest of us must tighten our belts and push our way through this financial crisis. Yes, government is big, but it needs to in order to continue to provide the many services private industry would love to try to control. Yes, Obama bailed out Wall Street because the legislature removed all restrictions and regulations that were in place to prevent this crisis in the first place. Yes, Medicare is draining our economy and needs to overhauled. However the knee jerk reaction of attempting to eliminate it now, and removing even more people from the workforce by eliminating government jobs is not the way to handle this crisis. It is time that the people that can afford to take the hit do so. It is time to contribute money to the collective pool of people that have helped you enjoy the silver spoon in your mouth. In fact we are not talking about taking a silver spoon and turning it to wood. These tax in creases would just be removing the diamond studs from the already bejeweled platinum spoon. Do not be fooled by the rhetoric and deliberate fabrications that have been spewing from the forked-tongued mouths of Republican politicians who are showing their true allegiance to the wealthy constituents who they truly represent. Their deceptive tales of how “Joe Public” is being held hostage by big government and how tax cuts will benefit the little man is almost as laughable as the job the district attorney in Florida did in trying Casey Anthony. It is up to us to make sure that another travesty of justice is not perpetrated on our watch. Listen up Republicans, you were fooled once by electing Bush to a second term. You were fooled a second time by giving your blind support to the laughable lineup of Republican candidates your party keeps parading in front of you. Each one goofier than the next, not even qualified to lead a tour on Disneyland’s Jungle Cruise let alone the free world. Please be smart now and let your pocket book lead you to a smarter decision this time around. 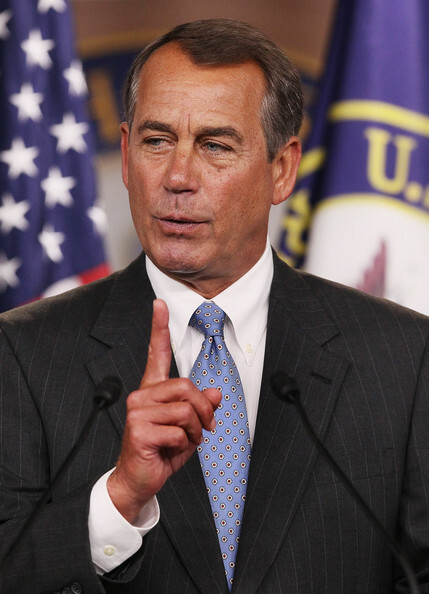 Don’t believe so blindly what Boehner is telling you. Support your president and hold these traitorous Republican charlatans accountable for playing chicken with our livelihoods, our money, and our country.